In the mid 1970’s the US Armies Tank-Automotive Research and Development Command started work on two designs for a new tank that was lighter and thus gave a much improved level of mobility than those tanks in current army service at the time. The first design was the “High Mobility Agility Test Vehicle” aka the HIMAG and the first prototype was completed around 1978. To reduce weight it did away with a conventional 3 man turret and the heavier 105mm Main Gun (as fitted on the M60 Series, which was in service at the time) in favour of a smaller less armoured barbette mounting a 75mm main gun with an autoloader. 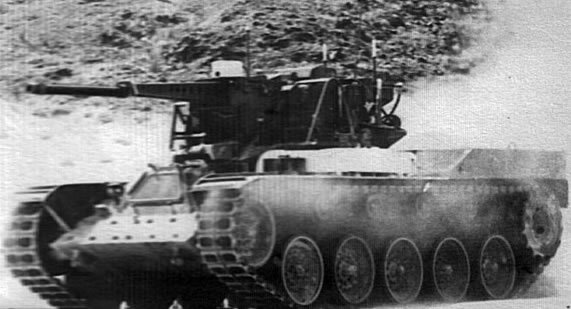 The fire control system had infrared sights and a gun-laying radar was tested. It used a conventional tank hull, which was fitted with a new hydro pneumatic suspension. The vehicle never entered service. Armament: x1 75mm main gun / x1 7.62mm MG?